The Internet has turned the flow of information between sellers and buyers completely up-side down. Gone are the days when sales people controlled the conversation and the exchange of information. You might have great solutions and distinct advantages over your competitors, but if you can’t get out in front of them you can’t get the sales you need. Too many companies spend too much time and money on digital tools and platforms with little in return to show for it. Today’s marketers and sellers need the right tools and processes in order to close deals faster. 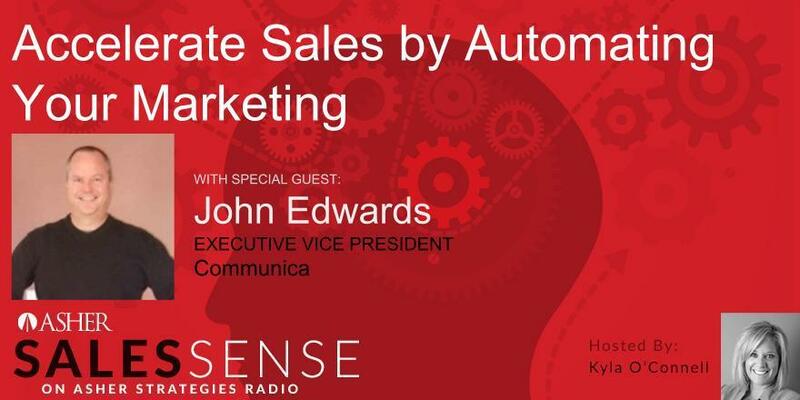 There’s an art to this digital craft and John Edwards has great tips and ideas for how you can “Accelerate Sales by Automating Your Marketing.” What are the latest trends and emerging technologies in the marketing and sales arena? What are the single most important things you should focus on to make your company findable? How can you get digital platforms to work together seamlessly? Learn the answers to these questions plus more during the upcoming episode of the “Asher Sales Sense” podcast on Asher Strategies Radio. John is a marketing, sales and consulting professional with over 25 years of experience at leading organizations such as Time Warner, AOL, Netscape, CompuServe, and Communica. As Executive Vice President with Communica, he helps direct digital marketing and sales initiatives for both B2B and B2C clients. Areas of focus include strategic consulting, digital tools and platform integration (including marketing automation, CRM, and social media), as well as content development expertise - all designed to accelerate marketing and sales. He works with companies across a broad range of industries including manufacturing, media, telecommunications, consumer products, e-commerce, healthcare, professional and financial services, and more. He’s often called on to help clients develop and implement sales best-practices and processes. John is Marketing Skills (A/B/C) and CRM-Field Marketing Certified through the Business Marketing Institute, and has also been an active angel investor, entrepreneur, and advisor working with portfolio companies at the Ohio Tech Angel Fund, 10x Accelerator, TechColumbus, and others. If you think LinkedIn doesn't matter for your business, here's why you're wrong.